Quaker Hill Burial Ground Association, Inc. The Taber Cemetery, off North Quaker Hill Road. Of the above, only the Quaker Hill and the Quaker Cemeteries are active for burials, but plot sales in the Quaker Cemetery are limited to family members of those in the cemetery. New plots in the Quaker Hill Cemetery are available for purchase. With the exception of the Taber Cemetery, access to any of the cemeteries is permitted during daylight hours. Access to the Taber Cemetery requires permission from the landowner. All plots in the Quaker Hill and Quaker Cemeteries are sold in accordance with the provisions of the laws of the State of New York, and shall not be used for any other purpose than as a burial place for dead human beings. A letter of agreement will be issued to the purchaser of each plot. The agreement will include plot number and section as they appear on the Cemetery map. Purchaser must provide contact information, including e-mail address, for future correspondence from the Cemetery Association regarding maintenance and operation of the cemeteries . Families of the interred are expected to keep the Cemetery Association aware of future contact information changes. monument or marker. Sale does not convey title to the land. place. See the attached price list. If no burial has taken place, the plot will be purchased by the Cemetery Association at the original purchase price. Burial rights obtained through inheritance shall be recorded with the Cemetery Association by the person receiving the inheritance. If the plot or plots are not specifically mentioned in the will, and are not left to a specific person or persons, ownership passes to the descendants of the owner. Under these circumstances, the surviving spouse does not share in the ownership, but she (he) has an absolute right to be buried with the late husband or wife. Transfer of rights by gift within a family can be done by giving the Cemetery Association a document of Irrevocable Designation for the person or persons receiving the gift. No interment shall be allowed without permission being first obtained from the Cemetery Association and payment in full for the plot and interment made to the Cemetery Association. Plot owners are prohibited from allowing interments to be made on their plots for compensation. All Funeral Directors shall provide the Cemetery Association with Certificates of General Liability and Automobile Insurance annually naming the Cemetery Association as Additional Insured. The marking, digging and filling in of each grave following burial is the responsibility of the Cemetery Association. All other work done in the Cemeteries, including grading and reseeding the grave site, is the responsibility of the Caretaker under the supervision of the President and the Board of Directors. The Funeral Director will provide the Cemetery Association with a Burial-Transit Permit with the name, age and date of birth and death of the deceased, the time and date of the interment, and if not an adult, the name(s) of parent(s) or legal guardians(s) of the deceased. Burials in these cemeteries are in plots measuring nine (9) feet by four (4) feet. Concrete vaults or grave liners are required for interments in all graves. In the case of cremation, two (2) canisters or urns, made of wood, metal, plastic, or concrete, may be buried in the same plot. Cremated remains may not be scattered over any part of these cemeteries. Only human (body or cremated) remains are permitted in each grave. Burials may take place any day of the week, including holidays, providing in the case of the latter, the Funeral Director agrees. Nothing herein shall require the Cemetery Association to provide grave openings and/or interments if they are unable to because of severe weather conditions, or because the ground is frozen. If rock has to be removed, the plot owner will be assessed an additional charge for the removal. See attached price list. Disinterment will be allowed at the direction of the Cemetery Association provided the provisions of Section 1510(e) of the NYS Not for Profit Corporation Law are complied with. No monument or plaque will be allowed to be delivered to the cemeteries until a concrete foundation is installed and ready to receive the monument. The Cemetery Association will install the concrete foundations and invoice the Funeral Director or provider of the monument. All monuments must be constructed of granite or bronze. 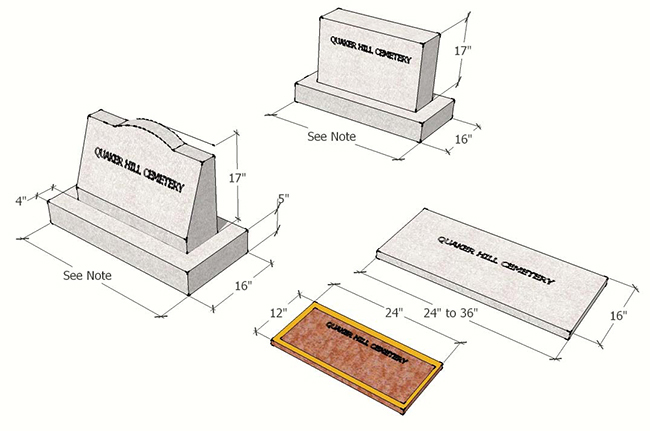 Granite monuments must only utilize colors of natural stone, and can be of two types: 1) Flush, or 2) Horizontal stone to a height of five (5) inches from the foundation with a flat faced or slant faced vertical stone no higher than seventeen (17) inches set back four (4) inches from all edges of the base. For a monument(other than Flush) marking two (2) graves, the requirements are the same, but the monument can be longer. Note: Monuments can be up to 36" wide for single graves and up to 60" wide for double graves. The Cemetery Association may repair or remove any monument or marker that has fallen into disrepair and/or creates a dangerous condition, provided that the Cemetery Association has first given the owner at least sixty (60) days to effect repair, and the owner has failed to do so. Any monument or marker that is removed as provided above shall be replaced with a flush bronze or granite marker suitably inscribed. No form of planted material can be used to decorate burial plots or monuments. Cut flowers or live plants in non-breakable containers can be placed to decorate grave sites. Placing of glass containers as receptacles for flower, either artificial or grown, is prohibited. Any form of decoration containing wire or other metal that can injure maintenance workers is prohibited. The Cemetery Association reserves the right to remove all flowers, wreaths or other decorations from plots as soon as they become unsightly, and to remove, after due notice to the lot owner, any embellishment on the lot, effigy or inscription which, in the opinion of the Cemetery Association, is unsightly, dangerous or inappropriate. Land occupied by human bodies will remain a cemetery. Should either the Quaker Hill or Quaker Cemeteries no longer have vacant grave sites; the Cemetery Association will continue their maintenance. Should these properties, for whatever reason, be devoted to another purpose, the Cemetery Association will assist in having the bodies disinterred, and buried elsewhere. These rules and regulations are abbreviated and in the process of being updated. As the specifications for the stones can be confusing, it is best to walk around the Quaker Hill Cemetery and look at existing stones and pick one whose look is appealing. Different colors, shapes or sizes will probably not meet our specifications. Regarding decorations for plots we ask for cut flowers, wreaths or live plants in containers rather than planted items in the ground and artificial decorations and adornments for the graves. Improving the appearance and dignity of the cemetery is our goal. As you look around the Quaker Hill Cemetery you will see planted items in the ground near some stones. We do not want to extend this practice as it affects appearance and makes the job of our caretaker more difficult. Please feel free to call the president to discuss any of these rules and regulations or any other issues concerning the policies of the cemetery. Plots are available in The Quaker Hill Cemetery. Download the Quaker Hill Burial Grounds Association rules and regulations. Historical information on this website has been drawn from the records of the Association and booklets of the Quaker Hill series, particularly those by Reverend Warren H. Wilson, as well as the records of Jennie Toffey Green.